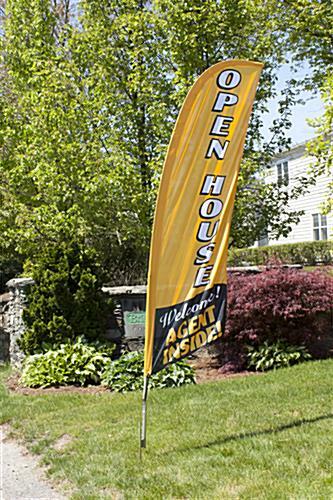 The Open House Swooper Flag Sells in Many Color Schemes! This Banner has a White on Orange Message that is Easy to Read! Fly the Open House Swooper Flag to Ensure Everyone in The Area Knows a Home is For Sale! 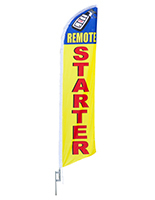 Nylon carrying bag and easy assembly make this real estate flag portable. Knitted polyester fabric for use outdoors. Open House Swooper Flag - "OPEN HOUSE, WELCOME! AGENT INSIDE!" 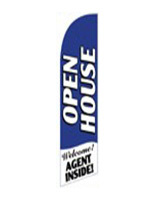 This 8 ft portable open house swooper flag is specifically designed for agents whom are constantly showing homes in different locations. A black carrying bag that will easily fit into a car trunk is included with the purchase of these advertising banners. 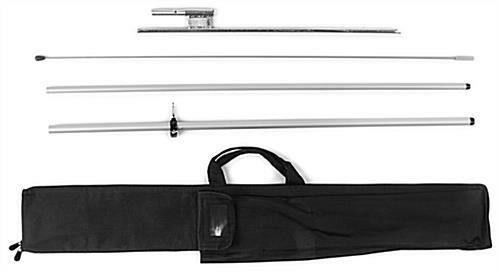 All components of this low price open house swooper flag break down to fit compactly inside the bag. The bag's interior has slots for all the components, so they stay neatly organized. 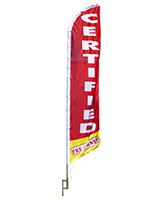 This feather banner is an open house swooper flag that comes with an aluminum and fiberglass pole. The top (2) sections of the pole are fiberglass, while the bottom (2) sections are aluminum. There are advantages to purchasing this open house swooper flag that gets homes sold fast, oppose to a more expensive model. Primarily, these advertising feather banners cost a fraction of what similar outdoor displays with 100% fiberglass poles do. The feather banner, open house swooper flag also includes a ground spike that securely anchors into the ground. A cord then attaches the banner to the pole to ensure the pennant does not fly off. 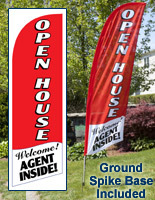 This open house swooper flag that anchors into grass is pre-printed, allowing it to ship much faster than a custom unit. The fact these outdoor real estate displays are ready to ship immediately is critical for real estate agents that have an important upcoming showing and need advertising equipment fast. Bold white letters that read "OPEN HOUSE" are vertically oriented along the length of the banner. Under the main text, "Welcome! AGENT INSIDE!" is printed in white font on a black background. This open house swooper flag, also known as a feather display, is very welcoming due to the added text notifying potential buyers of agent availability inside the property. While the message appears to be custom, it is generic enough for use at a house showing or at an apartment complex simply trying to fill vacancies. 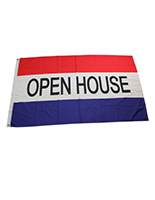 Each open house swooper flag is affordable enough that numerous units can be purchased for exhibit on the front lawn of a home or along the entrance of an apartment complex. The combination of affordable price, portable design and easy to read lettering makes these feather banners one of the best values online!